Find the most accurate, durable, and easy-to-use all-purpose tape measure for your needs. The “measure twice, cut once” adage is key to the success of all kinds of craft and construction projects. 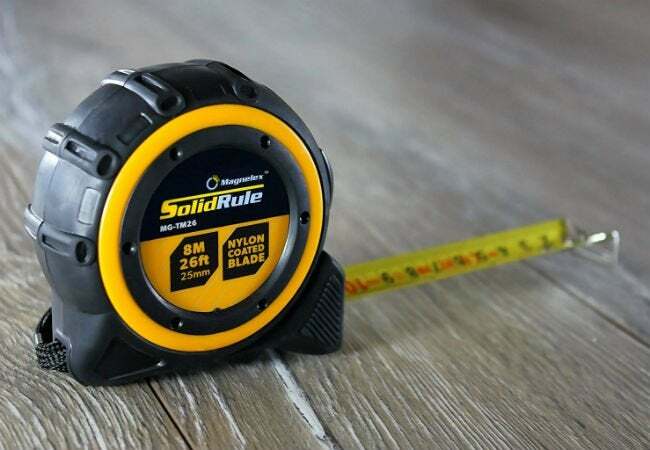 To follow it, you’ll often need to rely on a tape measure—a flexible cloth, metal, or fiberglass ribbon, of variable length, with measurement markings. While you no doubt already own one, tape measures have subtle design features to allow greater precision and ease, depending on the job at hand. You may, in fact, need more than one in your toolbox! Finding the best quality, general purpose tape measure is a must. Read on to learn what to expect from the best tape measures, and check out our top-rated picks based on industry standards and consumer satisfaction. The right tool for the job applies to tape measures, so there are four basic varieties to choose from. Cased tape measures, the most popular and versatile design, house the blade—the metal or fiberglass measuring strip—in a rubber or metal holder that can be easily stowed in a pocket or clipped to a tool belt. 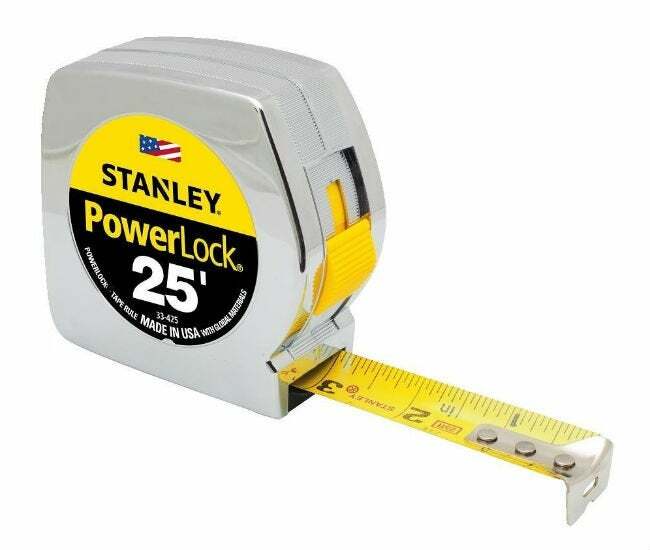 A standard 25-foot tape measure can be used for a variety of building and craft purposes, such as installing shelving, hanging pictures, and wood-working. Long or open-reel tapes—used primarily by engineers, contractors, and builders—have a hand crank for retraction, and can be between 25 and 500 feet in length. They are typically made of coated fiberglass, have measurement markings in both feet and meters, and may have a bottom spike for increased stability when measuring ground distances. To measure columns and other circular objects, use a diameter tape (D-tape), which is similar to a cased tape but contains an ultra-flexible blade of cloth or metal that can easily wrap around pipes and poles. D-tapes provide an accurate measurement using pi to calculate circumference (the length around a circle) and diameter (a straight line passing from one side of a circle to the other). D-tapes come in a variety of lengths, from 12 inches to 50 feet. For sewing projects, a cloth or vinyl model is preferable, because they mold more easily to the body, for fashion design and alternations. Sewing tapes come in a range of lengths, from the standard 60 inches to the extra-long 120 inches. Sewing tapes may be a simple strip with metal ends (to prevent fraying, if made of cloth) or housed in a retractable case. Standout blade. The tape itself—known as the blade—should stay straight and firm when extended. Cheap blades bend easily, denting and dipping in places. Quality blades, made of steel or fiberglass, should literally “stand out” for 10 feet or more. Metal blades coated with nylon are highly durable and versatile. Tang. The metal end-hook at the tip of the tape measure ensures an accurate reading, but too often the tang is the weakest part of a tape measure. When shopping, make sure the tang looks and feels solid without being static—there should be a slight in-and-out movement (called “floating”) when you tug it gently. You’ll notice that when the tang hits a wall or solid object, it retracts slightly. When you hook the tang around an edge, it pulls out slightly. The tang is designed to float to compensate for its own width, providing consistent and accurate measurement. Magnetic tangs act as an additional tool—picking up stray metal items like screws and assisting a solo measurer. Belt clip or holder. Cased tape measures are often equipped with a belt clip—a steel or nylon pincer that attaches to a tool belt or pocket. Some pros and do-it-yourselfers find the clip annoying because it adds bulkiness and may make the tape measure harder to hold or stow in a pocket. If you find this to be true, you can unscrew the clip or buy a clipless model. Auto-lock. 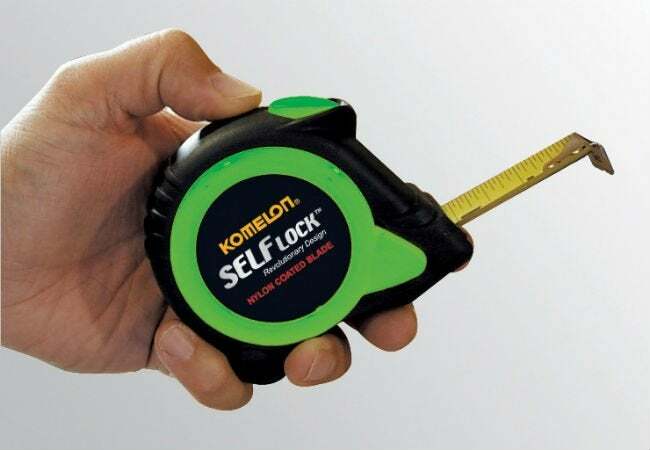 A tape measure that automatically locks when pulled out is especially helpful when working alone or in tight spaces. For example, if you’re measuring the inside of a cabinet, the blade will lock into position by itself, ensuring an accurate reading. Simply press a button and the blade will shorten or fully retract, depending on when you release your finger. Markings. This refers to the information printed on the blade, which should be clear and easy to read. 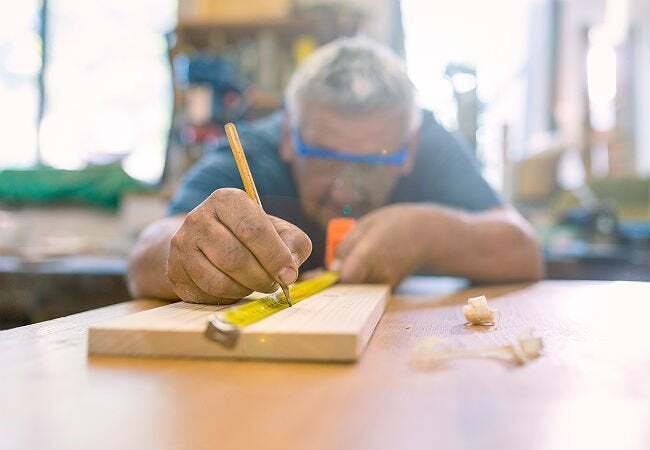 Most important are the measurements: The “imperial system” of feet, inches, and fractions of inches is used in the U.S., but if you think you may need to make conversions (for a rug or piece of furniture from abroad, for example), get a tape measure that also has metric markings. Stud marks—red bars noting 16-inch intervals—keep newly constructed walls in compliance with building codes (studs must be placed 16 inches apart). The black diamond shapes help you locate the center of studs (as long as the structure was built in compliance with standard codes). Stud marks make hanging pictures and installing shelves much easier, allowing you to anchor the nail solidly. 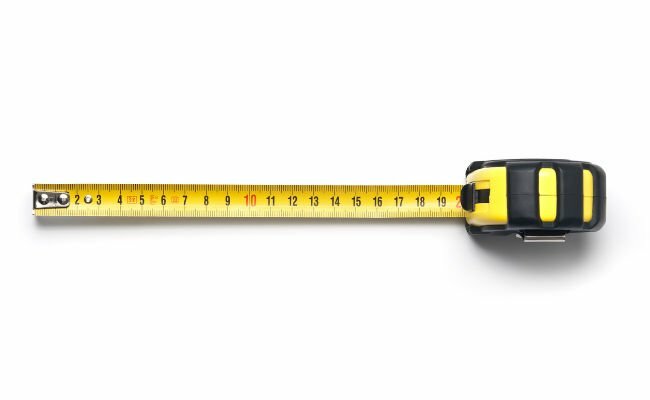 According to research by the review website Wirecutter, a tape measure is the single most-used tool on job sites, so it’s worth investing in a better model. Our picks focus on traditional 25-foot metal styles—the most popular and generally useful tape measures. The classic Stanley Powerlock is consistently rated the best for professionals and DIYers alike. It has a sturdy belt clip, floating tang, and steel blade coated with Mylar to increase longevity. This model has been tested by market researchers for blade standout, tang strength, and case resilience—and has won Wirecutter’s award for Best Tape Measure. With more than 1,300 reviews on Amazon, it also receives a 4.5 out of five-star rating, yet still turns out to be one of the most affordable tape measures you can buy. Pros at Business Insider and ProTool Reviews consistently rate the Stanley Powerlock as a sturdy, “no-frills” but reliable choice. Available on Amazon. If you’re looking for a rugged, professional-quality tape measure, choose the Magnelex Solidrule. It boasts measurements in both meters and inches, a nylon-coated steel blade, a comfortable no-slip rubberized case, and a wrist strap (instead of a clip) for easy handling. Nearly 81 percent of Amazon reviewers gave the Magnelex five stars. Though considered a top option for heavy-duty construction, DIYers nonetheless appreciate its lifetime warranty and 100 percent money back guarantee. Available on Amazon. This tape measure‘s reviews on Amazon are glowing—with a 4.5+ star rating and customers praising its smooth action, fine control with auto-lock feature, and soft rubber grip. Professional reviewers at Expert Trades offer a five-star stamp of approval too, for customer service, product quality, product range, and value for money and noting a “unique patented magnetic end hook” which results “in easier one-person measuring.” Available on Amazon.